PREVENTS SPYING by hidden microphones that may be recording your conversations. Perfect for confidential discussions at work, in hotel rooms and other places where you want secure, secret communication. Get optimal performance with 7 ultrasonic transducers and improved suppression system that effectively masks speech. USES INAUDIBLE ULTRASOUND and quiet white noise to jam and block recording by microphones and phones. Ultrasonic vibrations will mask your speech so that microphones can't clearly detect what is being said. Effective for up to 23 feet or throughout a medium sized room. Powered from a 110/220V power source or built-in battery for up to 3 hours of continuous use. KEEPS SPEECH FROM BEING RECORDED in adjacent rooms or outside the door and windows. White noise like this is often used by doctors and professionals who need to have private conversations with their clients and associates. Gives you extra comfort and effectiveness without the stress and anxiety of others listening in. Includes a jack to connect an additional ultrasonic speaker for additional effectiveness of suppression. UPGRADED HARDWARE creates a virtual wall in TURBO MODE. This is the most effective microphone jammer created yet. Works exceptionally well blocking leading recording devices manufactured around the world. This is the security insurance you need to fully protect your privacy from interlopers and would be spies. 100% MONEY BACK GUARANTEE ensures this will quickly become your favorite no-risk purchase. Many people are stocking up with several of these to place around their home or business. HURRY AND BUY NOW while we have this very popular technological advancement in plentiful supply. This makes a thoughtful birthday gift, holiday present or anniversary gift for anyone who values their privacy. 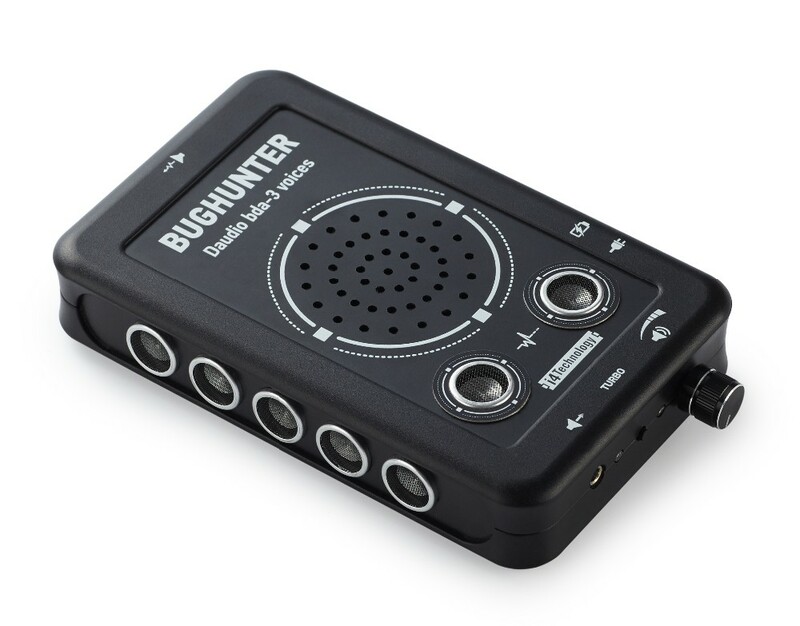 BUGHUNTER DAudio BDA-3 VOICES is the ultimate jamming technology to effectively disable planted bugs, listening devices, hidden microphones, and people listening from behind walls, doors, and windows. Secures your conversation and activities from spies, interlopers and eavesdroppers who try to listen in. EFFECTIVE SECURITY PROTECTION from spying spouse, nosy boss, pranking friends, government surveillance and much more. We've upgraded this latest version with 7 powerful ultrasonic transducers that pump out the frequencies that confuse and disable voice recording devices with all types of microphones. With transducers on the side and top, this unit creates a virtual wall of inaudible ultrasonic interference that protects you from listeners. POWERFUL ULTRASONIC SIGNAL UP TO 120 dB that envelope you in sonic protection for 23 feet (7 meters) in a wide angle. Most competing models, especially those made in China, are 2 to 3 times weaker. Want even more protection? Set on TURBO MODE to activate a special generator emitting ultrasound at a slightly different frequency. Gives you improved protection without raising emission power. You won't find this highly desirable feature on other models. 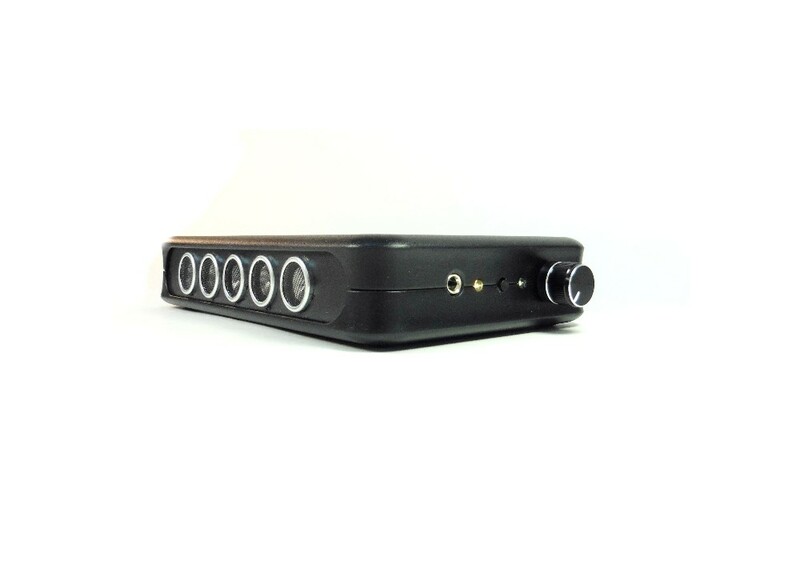 EXTERNAL JACK for additional ultrasonic speaker. Many people place the BugHunter on a table with another speaker under the table. This will completely confuse and render useless any listening device that may be hidden in covert places. Gives you ultimate protection from detection. Phones and other types of devices are sometimes better jammed with white noise also produced by this unit. Now you have complete privacy to keep nosy others out of your important business. EXCELLENT GIFT IDEA for anyone who likes the latest technology and values their privacy. This is perfect for friends, family and co-workers. Living in this high tech age means we have to take high tech measures to ensure our privacy and protection. Get the BugHunter DAudio BDA-3 Voices for best results and outstanding value. DISCLAIMER: Please note that BDA-3 is just a tool, complementing and reinforcing the measures taken to protect you from eavesdropping and recording. To increase the security of your conversation do not increase the volume of your voice. A volume similar to what you would use in a crowded coffee shop is ideal. If possible, lean forward towards your interlocutor or sit closer to each other, then place the device on the table between you. Create as many sources of ultrasonic emission as possible. Always consider using audible white noise interference. Do not hide the device in a pocket or bag while in use. The unit should be as close to the speakers as possible so that the conversation is drowned in noise. How effective is BDA against new phones/ iPhones/ old analog dictaphones? -In silent ultrasound mode you need at least 2 (or better 3) ultrasonic sources for jamming recording by waterproof phones. 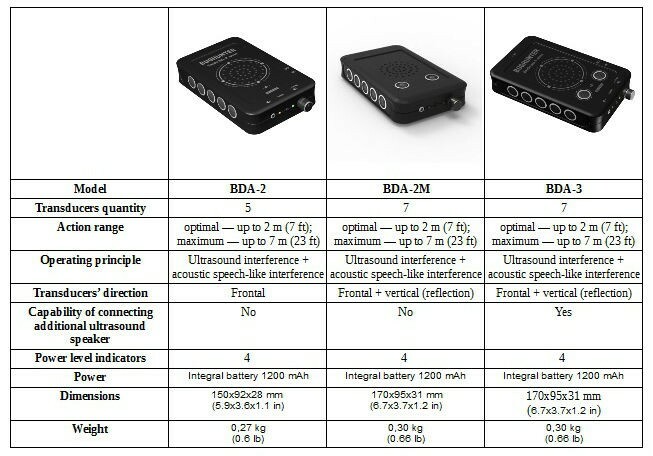 For example, BDA-3 + two external speakers. But 100% result is only possible with using of white noise function. -Ultrasound jamming works poor with Analogue Dictaphones, and usage of white noise is necessary. How effective is BDA in ultrasound (silent) mode? 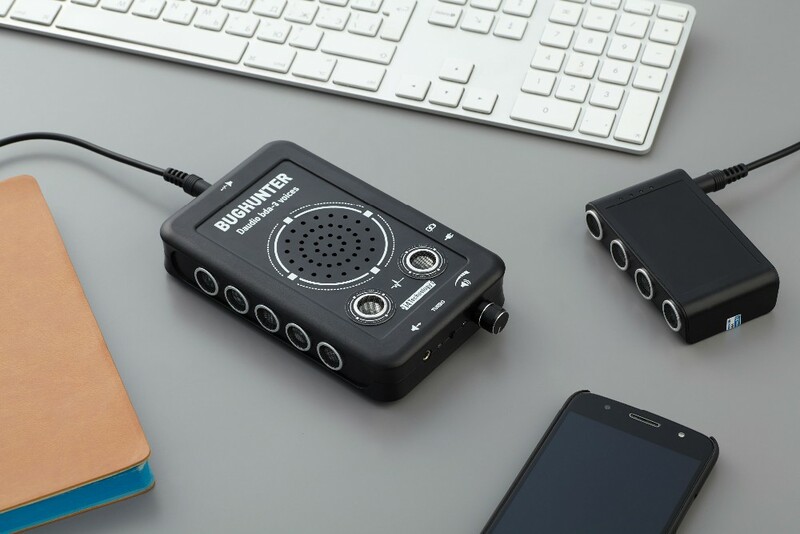 -The highest effectiveness is reached with digital recorders when it's placed on the same level with recording device between the source of sound and the recording device (it plays the role of a virtual wall). Can I use the BDA so nobody knows it? -In ultrasound mode it is almost inaudible by most people. Additional external speakers should be placed under the table. How long does BDA work without charging, can it be used while charging? It depends on intensity of use; maximum is – up to 3 hours. Device can be used while charging. What is effective distance of jamming? -When placed on the same level with recording device – up to 7 m. For waterproof phones – 2 m.
Can it jam phone signal or video recording? -No, it only affects the membrane of microphones. What types of microphones can BDA suppress? 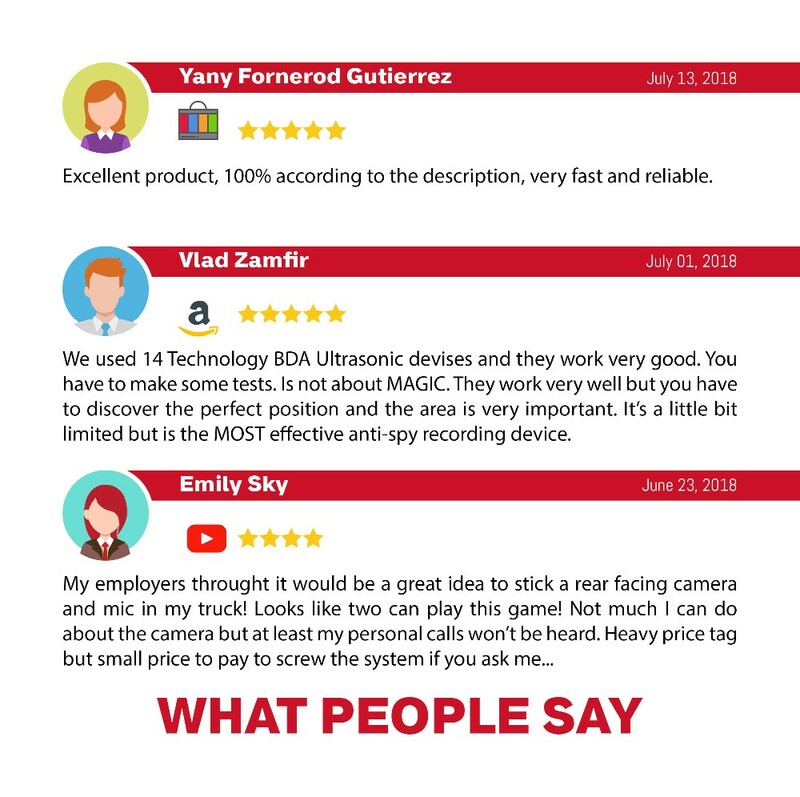 -When using both ultrasound and white noise BDA suppresses recording on all types of microphones including Laser microphones that reads vibrations on the glass. Such combined interference is extremely difficult to clean. Device generates ultrasonic signal through 7 transducers. Frequency is determined by a micro-controller and variates according to a specially developed algorithm. Ultrasonic signal affects recording paths of spyware which results in them fixating only indiscriminate noise in which conversation can't be distinguished. Besides, powerful speaker creates acoustic speech-like interference which destroys the meaning of the conversation: because of it spyware fixates only indiscriminate muttering, restoring the conversation becomes physically impossible. Acoustic interference is generated randomly so it can't be filtered out even on special equipment. Acoustic speech-like interference guarantees the confidentiality of the conversation but has one flaw – unlike ultrasound it can be heard and my be a nuisance in a conversation. Our developers took this into account and developed "BugHunter DAudio bda-3 Voices" with an ability to adjust the volume of the acoustic interference. You can always adjust the volume so that device won't muffle your speech and you could speak comfortably. If suppressor is a nuisance, just turn the volume down. Turning the knob to a minimum you will turn the acoustic interference off. If acoustic interference is turned off, suppressor will be working completely silently (except TURBO mode). One will not pay attention to the working device. If you hide it under the table, for example, there will be no clear evidence that suppresor is working. But without the acoustic interference reliability of protection becomes lower. If you want to be 100% certain that ALL devices with microphones are suppressed, you will have to tolerate small inconvenience. Use the suppresor stationarily or portably. 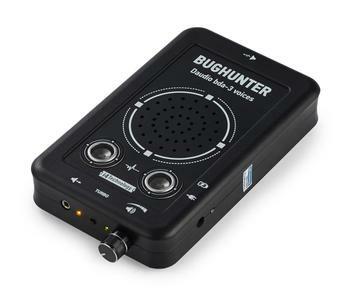 "BugHunter DAudio bda-3 Voices" can be powered by power supply or by a built-in battery. Its charge will last for a few hours which is a good number for a device of this power. Wherever you go, suppresor will always be with you ready to protect you from spying. And you can charge it and use stationarily when you get access to a power supply. - Microphone, bug and tape recorder suppressor "BugHunter DAudio bda-3 Voices" with seven UV- transducers and acoustic silencer. our strategy appeals well to our clients and customers and we will continue living by it: "Production quality, durable devices which conform to declared characteristics". This item is shipped by EMS Express from Russia within 1-2 buisness days. Delivery time varies between 7-20 days depending on the geographical region.